•	Johan’s investment in October 1999 has yielded 12% p.a. Ismail and Sipho are not impressed. They are disappointed, frustrated, even angry. Joanne has been in for five years and though not overjoyed, she is relatively relaxed as she does not need the money anytime soon. She also knows that most investors have had the same experience. Mary thinks it is a great investment and she cannot believe her luck in investing just after the 2008/9 crash. She always tells us how afraid she was to invest at a time when it seemed capitalism itself seemed like it might collapse. She is so thankful she did. Peter is not as happy. He invested in 2008 at the start of the second greatest stock market crash ever and saw his investment go down -21% in the first year. But rather than jumping off a building, he feels relieved and vindicated with his 10% p.a. return. He is not hitting the benchmark set but he is relieved with the recovery that has taken place. Johan invested in 1999 and cannot remember all the crises he has endured over the years. After meeting our investors, what do you think? Which were good and which were bad investments? If you take into account that the investment is trying to beat inflation plus 5% over a seven-year period, then it is a great investment. In fact, Peter is the only person to not achieve the target, only because he entered the investment a year before the big crash, but he has not lost everything. He still enjoys a 10% p.a. return. The good news for Ismail, Sipho and Joanne is that they have not yet been in the fund for seven years. They must now stay the course. 1. How long should I leave the money in the investment? In this case it was seven years. 2. When it goes very bad in any one year, how bad will it be? In this case it was -21%. What you can see in the illustration below is that investors who stick to the plan are generally rewarded. Markets are down, and now is the time to walk towards the market – like Mary — and not away from it, which is what Ismail is talking about. If an adviser can keep you from capitulating now, then they have earned their keep. Each small green bar on the above graph represents an investor who invested on the first of the month. The extreme left side of the graph represents a person who invested on 1 October 1999 (+14%p.a.). If that investor cashed out of the investment today this is the annual return they would have achieved. The grey bars on the right-hand side represent people who invested in the fund but have not yet been invested for the recommended full seven years. An example Is a person who invested on 1 November 2017 and whose investment has declined -7%. A person who invested on 1 Nov 2011 has enjoyed a 11% annual return, as reflected in the last grey bar. The green coloured bars represent investors who have remained in the fund for the recommended period (7 years rolling). The grey bars represent investors who have been in the fund for 6 years and 11 months. They have not yet hit the recommended period. The tramlines represent the benchmark CPI + 5-7%. 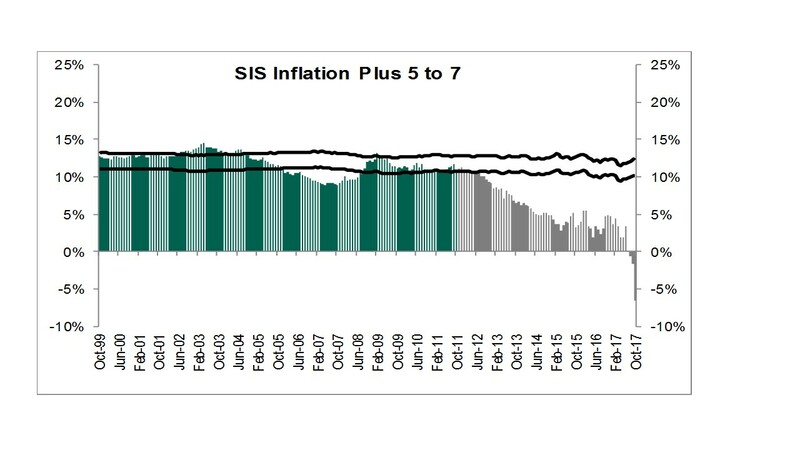 They go up and down as CPI (inflation) has moved up and down over the past 19 years. Very informative and encouraging information. Thank you!